My wife wanted family portraits done while the kids were still young and cute. If you want stale, uninspired, soul-less family portraits done, you can go to Wal*Mart or Sears. 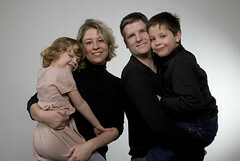 If you want cool, fun, amazing family portraits done by a couple of Toronto professionals who get it and work around your schedule and with your unique requests, you want Mark and Terri from Light Monkey Photography. If you live in the GTA and want to chat with Mark and Terry about how they can help you capture the perfect family portrait, write info@lightmonkey.ca or call 647-342-3603. Tell 'em Mike sent ya for a special deal! The last one with your daughter looks like it should be in a magazine. Great picture. Congratulations on your beautiful family, Mike! I love the one with your daughter kissing her Mom's cheek - that one will help everyone get through the rough patches (if they even happen at all). Thank you for sharing these Mike - a great way to kcik off the day! You're hideous. How did you get a great looking family like that?